A bird in Costa Rica who endured a brutal attack is going to get a second chance thanks to some innovative technology. A male toucan named Grecia lost the upper part of his beak after a group of vandals attacked the animal, according to Agence France-Presse. News of the bird’s mistreatment spread across Costa Rica in January via social media, and four companies volunteered to help Grecia recover, BBC News reported. The groups plan to create a prosthetic beak using 3-D printing in an effort to help the toucan eat on his own — a function the animal currently has great difficulty with. 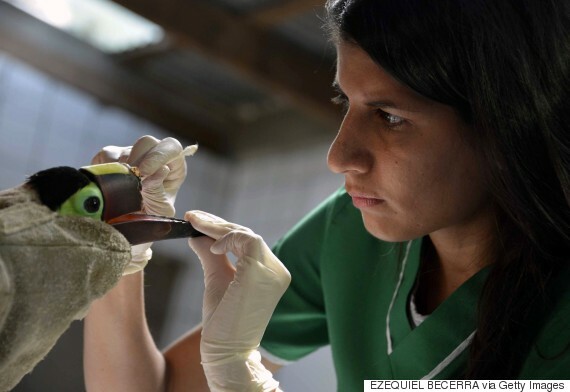 “The quantity he manages to eat on his own is very small, so we have to help him,” veterinarian Carmen Soto, who is looking after the toucan at the Zoo Ave rescue center, told BBC News. Those responsible for injuring Grecia broke his beak with a block of wood, The Costa Rica News reported. Work is currently underway to create a prosthetic appropriate for the bird’s use, which will become the first of its kind in the region, BBC News reported. While the attack on Grecia was horrific, it has raised awareness regarding animal abuse in Costa Rica. After the vicious incident was reported by local media, a crowd funded campaign was started to pay for an artificial beak for the bird. In less than 48 hours, $5,000 was raised to go toward the project, according to the fundraising page. Furthermore, the incident spurred Luis Guillermo Solís, the country’s president, to address the need to pass an animal cruelty bill, according to the Tico Times. Solis spoke to the press about the attack last month, saying, “these acts go against the respectful and peaceful society that characterizes Costa Rica,” the outlet reported. Today there is something to be thankful for at Midway Atoll National Wildlife Refuge – Wisdom, the world’s oldest living, banded, wild bird has returned! In the picture above, she can be seen (on the left) preening her mate. Wisdom’s mate has been waiting within a few feet of the pair’s former nest site since Wednesday, November 19. Wisdom was first spotted on November 22. we can celebrate by knowing she survived another year at sea and maybe returning very soon. This isn’t the first time these two have readied their nest. Laysan albatrosses mate for life and Wisdom has raised between 30 to 35 chicks since being banded in 1956 at an estimated age of 5. Laying only one egg per year, a breeding albatross will spend a tiring 365 days incubating and raising a chick. Albatross face many threats. Chicks can’t fly away from invasive predators like rats or escape weather-related risks like flooding and hot spells. If they make it to adulthood, they face different threats. Manmade problems like marine debris and pollution are dangers faced by all albatross. Although the population of Laysan albatross has strengthened to roughly 2.5 million, 19 out of the 22 species of albatross are threatened or endangered. WATCH Wisdom lay her egg!! Saturday afternoon when ever thing was calm I set my bird on the porch. And when I went to bring him in his cage door was open and he was gone. I need help finding him. Anyone in the Sherwood, Gravel Ridge and Jacksonville Area Please keep a look out for him He is Grey with a red tail, 12yrs old prefers women over a man. he’s very vocal talks whistles and ,makes other animals sound . Please help find my baby I hand feed him for the first part of his life. This is my lost Child. I’m not sure how far the wind could blow him. Today is Sunday Sept 2,2012 His Name is Ollie. He has a large vocabulary and cuss a lot says name’s Michelle, where’s Aaron, What’s up dawg and what’s up bro. WSP and so much more.